I was a little leery about trying out this recipe. I had tried the potato puree once before, very early on in my IP journey. I made it per the package instructions, and found that it tasted very pasty, not like mashed potatoes at all. But despite my reservations, I decided to try this recipe. It was quite a simple recipe to follow. The only modification that I made was to omit the cilantro. I hate cilantro! 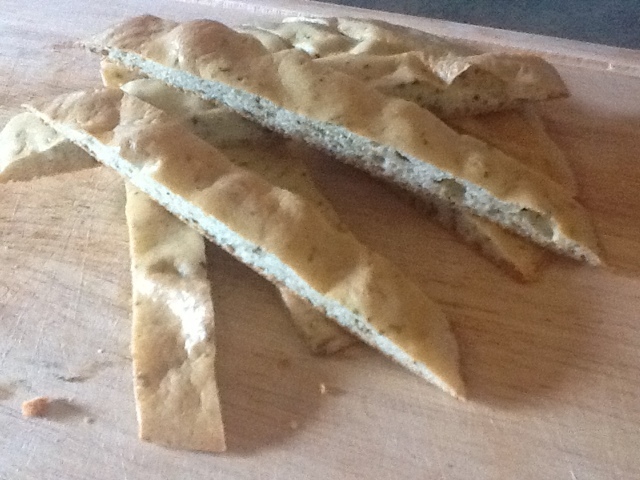 The flatbread came out of the oven smelling wonderful! It looked like flatbread. Definitely flat, but I wasn't really sure how flat to lay out the mixture on the cookie sheet. I let it cool for a couple minutes (might have been less because I was really excited!) and cut it with a breadknife into strips. I wanted to eat them as breadsticks with my soup. My first bite was......Amazing! The outside was crunchy and crust like, the inside was moist and tender. The mixture of seasonings gave it that little bit of extra flavour that worked really well together. I ate about half of it dipped into my veggie soup, and the other half plain. This is definitely something that I will make again. It is also very versatile, depending on how you cut it. I could be used as a flatbread, as a burger bun, as breadsticks, as a sandwich bun. A definite winner and an addition to my list of recipes to make again.